Mickey’s Very Merry Christmas Party has officially started and that can only mean one thing: TREATS!!! As usual, there were treats everywhere! By far one of the most unique offerings at last nights first party was the Vanellope Eclair. This delicious soft pastry is stuffed with fruity cereal vanilla icing. It is topped with a white chocolate piece featuring everyone’s favorite glitch and a delightfully colorful rainbow. It’s a bit of a mess to eat but wouldn’t expect anything less given its messy namesake. This treat is well timed (by design we are sure) because the long-awaited sequel of Wreck-It Ralph”- “Ralph Breaks the Internet” is in theaters November 22, 2018. we can’t wait to join Ralph and Vanellope into the internet on a mission to find a cable to fix Sugar Rush. You can find this crunchy sweet treat at Gastons Tavern in New Fantasyland. It is sadly NOT included in the complimentary treats offered with party admission but you CAN use a snack credit for it. 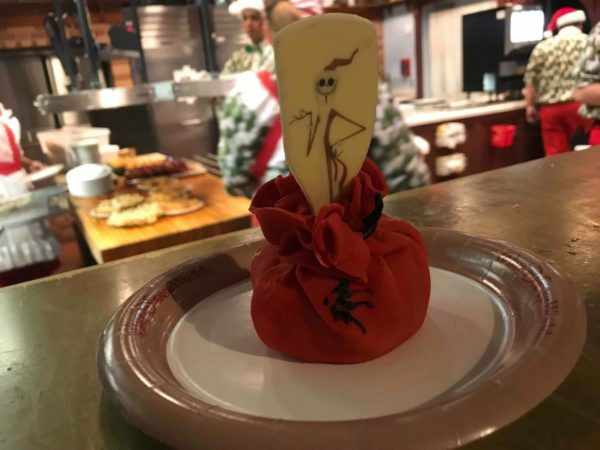 If you aren’t on the Disney Dining Plan (or are saving those snack credits for the Holiday Kitchens at Epcot’s International Festival of the Holidays, a strategy we can not recommend highly enough, by the way) this treat can be yours for $4.99 (+tax). Is this one on your must-try list? With so many delicious options and so little time (not to mention there is only so much room in one’s stomach) it can be hard to choose which to try and which to just WISH we tried.